If you’re fans of the Scottish Highlands and landscapes with a ruggedly wild charm, you’ll be in your element in the Scottish islands. The Inner Hebrides offer the ideal place to begin your adventure, with most being easily accessible by ferry. Here, we explore five Scottish islands of the Inner Hebrides to track down the best experiences for you to enjoy. 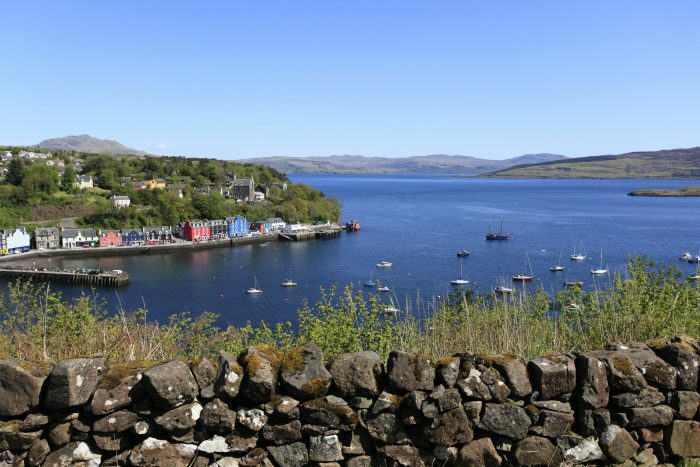 Jump aboard the ferry from Oban, which like so many to the Scottish Islands is operated by Caledonian MacBrayne, and a 45-minute smooth sail will deliver you to Craignure on Mull, the island with a worldwide reputation for excellent, varied and abundant wildlife. You needn’t wait to dock to enjoy your first wild encounters, though. Seals, porpoises and many sea birds can all be spotted en route, as well as a charming lighthouse. Once on the island, watch for white-tailed sea eagles swooping over the lochs or scan the skyline above sparse, rocky mountains for golden eagles hunting. On land you’ll find fallow and red deer grazing while hen harriers and short-eared owls skim over open ground in search of prey. Return once more to the water and watch out for otters, seals and dolphins – Mull really does have it all. Like much of the Scottish Highlands, acidic soil-loving species of plants thrive on the Scottish Islands, and nowhere more so than Gigha. Here, the Achamore Gardens delight visitors with a covetable collection of Camellias, Azaleas and Rhododendrons, as well as walled gardens. The planting itself is beautiful, if a little wild, but that’s the nature of the Scottish islands for you. Don’t leave without checking out the viewpoint too. You’ll have far-reaching views over the Atlantic to other islands from this vantage point, as well as the chance to spot some wildlife. It’s easy to reach the Isle of Arran from west Scotland. Simply board the ferry at Ardrossan and off you go! If you’ve read anything about Arran, you’ve almost definitely heard it dubbed ‘Scotland in miniature’. As you explore, keep an eye out for the industries that have taken advantage of both Scotland the Scottish islands’ landscapes and natural resources for years. From cheese-making to world-famous Arran wool, this island is a hive of heritage crafts, waiting for you to discover them. Connected to the Scottish Highlands by bridge, Skye is one of the most easily accessible Scottish islands by car. Make the most if it by hitting the road for Skye’s iconic fairy pools. These impossibly blue pools are fed by waterfalls, which combine to create what is arguably as close to a real-life fairy-tale as you can get. The downside is that they are a key attraction, so don’t expect to enjoy a swim to yourself and venture out early to make sure you can park. However you explore the Isle of Skye, the dramatic peaks of the Cuillin Mountains won’t fail to make an impression on you, even when masked in part by drifts of cloud. Experienced hikers can tackle the mountains’ climbs, but they are as challenging as the steep, craggy slopes suggest, so do so with care. If you’d like to head off the beaten track a little, then forgo the bridge crossing and take the small car ferry to Skye from Glen Elg. The bonus of this route? The local fishermen regularly throw some of their catch back, so your chance of spotting a sea eagle while you sail is pretty good! This tiny island has a reputation for making fine Scottish whiskys that far exceeds its size. With eight distilleries currently operating on the island, you could easily fill an entire week with whisky tastings and distillery visits as you tour the island from end to end. It might be one of the smaller Scottish islands, but for whisky connoisseurs, it’s the one to visit.